Brandykool or Brandy in short was a mix Beagle we got in 2002 in Gurgaon. She and a Labrador called Button were given to us by a family who were leaving for Canada. Button was left with friends in Gurgaon whereas Brandy came with us to Chandigarh, but after ten years we shifted to Delhi. Brandy was very acrobatic, very loving and she used to jump from sofa to bed. She used to disturb my son, Kunal, when he was having dinner. Two years back Brandy had a major operation, but she bounced back to normalcy soon. Then, she developed mouth cancer, which we couldn’t detect at the first place. 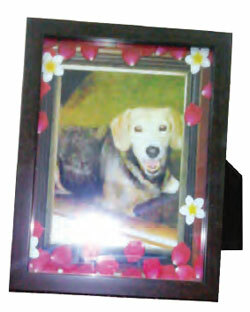 First, she was treated at a government veterinary hospital, and then we took her to Friendicos in New Delhi. As the cancer spread to her neck we used to feed her favourite chicken soup with syringe. My son was in depression as Brandy was his strength as well as mine too. She used to sit with me on sofa jumping from one sofa to another and to my bed, some feet above ground level like an athlete. The day she died we took her to Friendicos in the morning. After getting injection I picked her up in my arms as she could not walk and she collapsed and passed away. My son kept on saying “Papa, see what’s happening to Brandy?” It was on the cold day of 23rd December 2016. Next morning we took her ash to submerge into the river Yamuna. Still I have not got over her death. We finally decided to make T-shirt in her memory. I have a shop in the UK where the T-shirts with Brandy’s photo are selling well among my European friends. We feed stray dogs on 23rd of every month in our area in her memory.